The 2017 Atlantic hurricane season challenged critical infrastructure and key resources across a wide area. Harvey, Irma, and Maria each exposed different aspects of how density, dependencies, and distance impact expression of risk. Each event was dramatically different in terms of context, inputs, and outputs. But taken together this real-world stress-test of engineered systems, supply chains, and related networks offered helpful strategic insights. Survivor-facing lifelines are complex adaptive systems that tend to resist command-and-control, but are often predisposed to resilience, and can be influenced by effectively targeted choices. The author outlines several key factors that decision-makers should monitor to inform their choices. On August 26, 2017, Hurricane Harvey came ashore at Rockport, Texas. The next week Irma was pounding the Caribbean and targeting Florida. On September 20, Hurricane Maria barreled across Puerto Rico. This quick succession of three hard-hitting storms exposed several aspects of Supply Chain Resilience1 (and non-resilience). There is, however, a risk of network fracturing and seriously delayed recovery if 1) multiple dependencies within the system fail, disrupting the preexisting supply and demand network, 2) demand is separated from sources of supply by significant geographical distance3, and 3) population density is beyond the capacity of “replacement” supply networks to match demand. The consequences of Harvey, Irma, and Maria offer provocative evidence for both systemic resilience and the risk of catastrophic failure. The lessons taught by H.I.M. extend from the tactical to the doctrinal. This research highlights the following five structural issues that have potential strategic value for preparedness and response to future extreme events. This analysis pays particular attention to outcomes in the Houston, Miami, and San Juan metropolitan areas. Density of demand and multiple dependencies found in urban areas tend to amplify the risk of catastrophic cascades, but in all three hurricanes, non-urban areas were also seriously impacted. In Puerto Rico, the non-urban impacts have been especially troublesome and long-lasting. In many cases, rural areas are increasingly dependent on sourcing and distribution from urban areas. As a result, the five structural issues outlined are fundamental to effective preparedness, response, and recovery in both urban and rural contexts. The Houston Metropolitan Statistical Area has a population of 6.5 million with a density of roughly 630 persons per square mile. Houston is embedded within a very dense socio-technical-economic web. Proximity to the Dallas-Fort Worth Metropolitan Statistical Area (240 miles) and the San Antonio MSA (200 miles) creates a diverse, resource-rich matrix. The so-called Texas Triangle is a mega-region of 18 million people encompassing over 70 percent of the state’s population and an even larger share of its economy. Harvey made landfall roughly 190 miles southwest of Houston as a strong Category 4 Hurricane. While quickly downgraded to a tropical storm, Harvey stalled over Eastern Texas for most of four days inundating the region with up to 64 inches of rain. Over 80 Texans died. One month after the event more than 60,000 were still in temporary housing. Early estimates of financial loss ranged between $50 billion and $150 billion. However, there were also systems that showed remarkable resiliency. Below are three important examples of this resiliency in key systems. Given the outsize character of this extreme event, the resilience of these critical infrastructures is worth better understanding. Failure of any of these systems would have amplified negative consequences. The failure of even one of these networks can often initiate a catastrophic cascade. Supply Chain Resilience especially examines the interplay of densities, dependencies, and distance. Inside its urban loop, Houston’s population density exceeds 4700 persons per square mile. Roughly 25 percent of the nation’s refining capacity is in the Houston area. These sorts of concentrations create complex dependencies and interdependencies. The destruction and disruption in Houston caused by Harvey resonated across several national—and even international—networks.7From Saturday afternoon, August 26, to at least Wednesday afternoon, August 30, Houston’s surface transportation network was so seriously disrupted as to be essentially impassable. For most goods – including food, pharmaceuticals, medical goods, and fuel – the supply chain stopped on Friday evening, August 25 and did not resume until Thursday, August 31. Yet by Saturday, September 2 most grocery stores were re-stocked and hospitals, clinics, and pharmacies had what they needed. Consumer hoarding of gasoline complicated recovery of the fuel supply chain across East Texas.8 The production, transmission, and delivery of refined fuels continued to be seriously disrupted for weeks. But given the controlled shut-down of most refining in the region and the surge-in-demand associated with hoarding, even the fuel supply chain did better than might reasonably be expected. All in all, given how hard Harvey hit, it is an extraordinary demonstration of supply chain resilience. How did it happen? What can we learn? There were substantive – and continuing – problems, including the following. Close to fifty percent of regional refining — over 20 percent of national capacity — was shut down in advance of Harvey and was not yet fully operational when Maria hit Puerto Rico. In the days following Harvey, regional demand for refined fuels increased by multiples of 2 to 4 in many locations, presenting a significant challenge for fuel distribution and delivery. The loss of network integrity involving Colonial Pipeline connections west of Lake Charles seriously reduced the system’s capability to supply roughly 60 percent of the gasoline consumed between Atlanta and Baltimore. The failure of pumping at the Beaumont city water system—serving more than 120,000 residents 80 miles east of Houston—demonstrated the potential of analogous system failures. Most distribution centers, fulfillment centers, and warehouses were not flooded. But many of the most important supply nodes were surrounded by flood waters making distribution impossible for nearly one week. The surface transportation network in metropolitan Houston was under water in so many different places that the system came to a standstill. But once the water drained, most of the network was able to immediately return to full operations. Trucks and trailers were more available than drivers. More of each were needed. Spot prices for trucking soared. There was a lack of outbound loads to match inbound loads. Despite this litany of disruption, the supply chain problems caused by Harvey had transitory or modest impacts on sources of supply; most supply nodes survived, and demand – while temporarily separated from supply and sometimes relocated – remained close to the same as before the event. In the case of oil refineries and the Beaumont water pumping stations, there were serious disruptions of current supply capability, but capacity survived, pending repair and restart. Differentiating Capacity from Capability Matters. In assessing supply and demand networks, it is helpful to differentiate between short-term disruptions of capability and longer-term destruction of capacity. Capabilities can usually be replaced more quickly and flexibly than capacity. Where more capacity persists, less investment is needed for surge and/or replacement. Which Part of a Network is Impacted Matters. In assessing supply and demand networks, it is helpful to differentiate between effects to different elements of the supply chain, including sourcing, making/processing, distribution, delivery, and consumption. The farther “up” the chain the source of disruption or place of destruction, the more difficult to recover capacity. The higher up the impediment, the more surge and/or replacement investments are needed. Highway Infrastructure Matters a Great Deal. Considering the consequences of Harvey for Houston, what if the disruption of the surface transportation network had involved much more destruction? What are the implications of Harvey-in-Houston for a major seismic event in California, the Pacific Northwest, or mid-Mississippi Valley? With over six million people, the Miami-Ft. Lauderdale-West Palm Beach Metropolitan Statistical Area is crowded into a roughly twenty-five-mile-wide strip between the ocean and the Everglades. In the urbanized core of the area, population densities exceed 4400 persons per square mile. In Miami’s Brickell neighborhood, densities exceed 27,000 persons per square mile. In contrast with Houston, the Miami MSA is less part of a matrix and much more an appendage extending from sources of supply concentrated around Orlando (240 miles) and Atlanta (660 miles). On Sunday, September 10 after striking the Florida Keys as a Category 4 hurricane, Irma had a second landfall as a CAT-3 near Marco Island Florida, 100 miles west of Miami. Over eighty people in Florida died of storm-related causes. One month after the storm, damage estimates were in the $60 billion dollar range. Millions of people were evacuated. In the Florida Keys, roughly 25 percent of homes were destroyed. Irma was an enormous and powerful storm that threatened to encompass the entire Florida peninsula. Many meteorologists and insurance executives have commented that if Irma’s track had been even 20 miles farther east along the Gulf Coast, financial damages could easily have tripled.10 As it happened, metro-Miami was spared a direct hit. Tampa did not receive the catastrophic storm surge a slightly different track would have generated. Irma wobbled erratically from west to east to west. She was bad, but Irma’s track spared the densest concentrations of population and infrastructure. Nonetheless destruction and disruption were widespread. Given the forecast, operators of critical infrastructure were ready. An estimated 20,000 utility workers from across the nation were staged for the Florida rebuild. A nuclear power station was powered down. Fuel stocks were well above seasonal averages before the storm. Pre-event demand surge to support the evacuation and hurricane-hoarding seriously challenged fuel and food supply chains for the entire period September 4-9. Further analysis is needed, but on Labor Day Monday, September 4, consumers with the day-off seem to have been inspired by dramatic images from Hurricane Harvey’s impact on Houston and the foreboding forecast for Irma to begin a spike in demand earlier and larger than the supply network expected. Consumers arriving in stores on Tuesday found empty shelves and the hoarding response was fully ignited. On Wednesday, September 5, there were widespread retail shortages of food, fuel, batteries, and bottled water especially in metro-Miami and in Gulf Coast urban centers as well. There is some evidence that a Wednesday forecast for Irma to shift east eased demand on the Gulf Coast and allowed supply chain operators – with significant effort and creativity – to maintain minimally sufficient flows of supply into metro-Miami. Actual events proved this forecast to be inaccurate. On Sunday and Monday (September 10-11), Irma slowly careened north. Given Saturday’s forecast map, many supply chain operators had moved their truck fleets around and north of Jacksonville, fully fueled and loaded to begin rolling south as early as Monday afternoon. Instead Irma spent much of Monday depositing an event-total of 11 to 15 inches of rain between Jacksonville and Fort Pierce. High winds also took out power all along the I-95 corridor between Jacksonville and Miami. By Monday evening, supply chain operators were concerned they would only be able to make one massive delivery into metro-Miami late on Tuesday, but then – due to unavailability of fuel – would have to stop resupply until Thursday or Friday depending on when power-to-pump and fuel-in-the-ground was available. Continuous resupply was considered crucial to preempt hoarding behavior, especially in metro-Miami. On Monday night and Tuesday morning (September 11-12), power was restored to many truck stops and other locations along I-95. Key fuel supply nodes at Port of Tampa and Port Everglades were not seriously impacted by Irma. Both had significant reserves in their terminals and were able to re-start truck-rack operations by Tuesday morning. Both ports were re-opened by Tuesday afternoon and began off-loading new refined product into the system. By late Tuesday, the availability of power and fuel supported surge operations overnight and Wednesday. Most crucial supply chains were largely back to a semblance of normality by Thursday. By Friday, September 15, traffic congestion was the most often-referenced impediment to supply chain resilience. Concentration of Supply Matters. If the fuel capacity at Port of Tampa and/or Port Everglades had experienced long-term disruption or destruction, the post-Irma story would be very different. Similar concentration of capacity exists in many supply chains. Attention to protection, risk mitigation, and resilience of this kind of key node is fundamental. Diversification and geographic distribution are very helpful. Identification and qualification of the risk before a crisis will enhance response. Population Behavior Matters, Hoarding was the single largest experienced threat to the Florida supply chain. The surge in pull-signals nearly overwhelmed existing supply capabilities and seriously complicated what was already a difficult transportation environment. The largely successful evacuation of several metropolitan areas reduced population risk effectively. It is worth considering whether the evacuation would have been as successful if Harvey had not so recently demonstrated potential outcomes. Will the next evacuation order benefit from what Floridians have seen transpire in Puerto Rico? The entire island of Puerto Rico is smaller than the Miami-Ft. Lauderdale-West Palm Beach Metropolitan Statistical Area. The population of the U.S. Commonwealth is 3.4 million, with about 2.3 million concentrated in the San Juan metropolitan area. The density of this urban expanse is roughly 5,100 persons per square mile. Most of Puerto Rico’s supplies arrive into the Port of San Juan from Port of Jacksonville, Florida (1,300 miles). The electrical grid of Puerto Rico was fragile before Maria hit. Financial problems at the electric power authority resulted in many years of delayed maintenance and other debilitating issues. The storm seriously damaged the transmission network connecting generation facilities in the south to the metro-San Juan area.15 In the three weeks following the storm, no more than 16 percent of electrical customers were reconnected to the grid and restoration one day could be followed by loss of power the next day. Lack of available funds and credit seriously constrained pre-deployment of response and recovery assets. In the immediate aftermath of Hurricane Maria, the transportation network in Puerto Rico was seriously disrupted by debris in roadways, flooding, bridges lost, landslides, and other impediments. In most of metro-San Juan one week later, most debris had been cleared and the urban network was operational.19 But in mid-October the Commonwealth’s Department of Transportation identified 27 impassable primary or secondary roads and 550 transportation impediments, including 17 damaged major bridges, needing quick repair. Outside the metro-San Juan area some of these impediments cut off neighborhoods and communities from any delivery of supplies. Figure 1: Major Road Impediments as of September 28 (FEMA and the New York Times). Red line is the path of Hurricane Maria’s eye. Significant disruption of these three key critical infrastructures – power, telecommunications, and the transportation network – seriously complicated the resilience of Puerto Rico’s supply and demand networks. The telecommunications network’s dependence on the grid made it almost impossible for consumers to express demand effectively using credit or debit or Electronic Benefit Transfer (EBT) cards. Ninety-six percent of Puerto Ricans depend on the public water utility. The Puerto Rico Aqueduct and Sewage Authority (PRASA) operates 246 wells and 126 water treatment facilities.21 In the first week following landfall, roughly 45 percent of customers had water service restored largely because of either gravity feeds or existing back-up generation for pumping. Boiling tap water for drinking purposes was sometimes needed but difficult given the lack of electricity. By October 6, 55.5 percent of customers had water services restored. This addition was facilitated by repairs and new backup generation. One month after the September 20 landfall, 69.5 percent of customers were receiving water from the system (90 percent of San Juan-Metro area customers). Prior to Hurricane Maria there were 471 supermarkets in Puerto Rico, about one for every 7500 persons.24 In the first week after landfall, many grocery stores did not open. Lack of electricity and absent employees were the principal concerns. As those stores with back-up power reopened, lack of resupply became an increasing concern. Most food products arrive at the Port of San Juan via ocean-going barge, originating at the Port of Jacksonville, Florida.25 Crowley, Tote, and Trailer Bridge are the principal shippers. As with the rest of the island, dock operations depended on back-up power and several cranes sustained considerable damage. But there was not significant storm surge. Containers already landed survived with their products and dock operations restarted over the first weekend after the storm. It now seems that trucking operations were delayed by several actions, none of which were originally focused on truckers or trucking per se. All are in one way or another related to retail supplies of gasoline and diesel fuel. The widespread use of generators created a demand surge for fuel that exceeded the capability of the fuel distribution network to deliver.27 Prior to Maria’s impact, the distribution network had never needed to supply the full set of private generators simultaneously. Post-event demand for diesel has been about 5 times pre-event.28 Even if every pre-existing fuel tanker had been operating twenty-four hours a day, there was not sufficient capacity to meet this unprecedented demand. Transportation impediments and other complications also reduced existing delivery capabilities. To better balance supply and demand of fuel, two measures were taken: 1) an official nighttime curfew was put in place that disallowed most retail operations but was meant to allow wholesale distribution29 and 2) many fuel retailers imposed an informal quota on the purchase of fuel. Unfortunately, the curfew was initially misunderstood as restricting all operations (and, in any case, nighttime deliveries were discouraged by lack of lights). The quota system was even more troublesome. These informal quotas were often set at $10-to-$15, which would not fill most trucks. The quotas resulted in consumers constantly returning to refill their cars and fuel containers for private generators, creating huge lines. Both the quotas and the resulting lines discouraged – and arguably, did not allow – many truckers to refuel. A significant number of truckers stayed home even after the ports had reopened and many roads had been cleared. Otherwise they risked being stranded out-of-fuel. Once the sales quota on fuel for vehicles was made illegal30 and the curfew was curtailed and clarified, trucks began operating at levels comparable to before September 20. Between September 30 and October 15, port operations steadily improved and were quickly at 80 percent of pre-event normal, as well as handling the increased through-put of arriving FEMA supplies.31 Once trucking operations substantively restarted – during the first week in October – most aspects of the grocery supply network in Puerto Rico restarted. One month after landfall 417 of 471 grocery outlets had reopened. But a full month after landfall a key element of the demand network continued to be disrupted. More than 40 percent of Puerto Ricans depend on an Electronic Benefits Transfer (EBT) card to purchase most of the food they consume. The EBT card requires telecommunication capabilities that in most cases were not available in the immediate aftermath of Maria. Before September 20 about 2500 retail locations processed the Nutritional Assistance Program EBT card (also known as the Family Card or PAN card for Programa de Asistencia Nutricional). On October 20, only 983 or 39 percent of these retailers were open and able to conduct transactions with the PAN card. Outside the San Juan metropolitan area, the percentage of retail outlets accepting the PAN card was even smaller. Up to 1.3 million people had their ability to express demand for food reduced by sixty-percent or more. Grocery stores that could not transact PAN payments lost that portion of their usual cash-flow. Over the same period costs increased, especially costs associated with maintaining generator power. Price freezes on several food products were legally imposed September 3 in anticipation of Hurricane Irma and were continued.32 This combination of reduced demand, increased costs, and the inability to increase prices put many grocery stores at risk of failure. Preexisting network dependencies and interdependencies matter. Prior to Maria, the Puerto Rican electrical grid was unreliable, as a result a large and widely-distributed set of private electrical generation capability was already in place. The preexisting water system was fragmented and inefficient; after the event, this negative arguably became a positive. The interface between the port and on-island distribution hubs was complicated and recovery was delayed by heretofore “hidden” network elements. Distance and other impediments to the flow of re-supply matter. Perhaps the most serious and longest-lasting challenge to many supply chains was reestablishment of a predictable – and accurately demand-reflecting – flow of supply. The “pipeline” from Port of Jacksonville to Port of San Juan surged, but given the wide array of disruptions, this surge often reflected wild guesses related to actual demand causing a long-term bullwhip effect across many supply chains. Persistence of pre-existing supply and demand networks matters. The grid was down. Telecommunications was spotty or non-existent. It required several weeks for fuel distribution to reach an equilibrium with demand, but – somehow – within two weeks the grocery network was mostly operational. Especially important was the ability of consumers to express demand – using both cash and non-cash financial signals. If this had not happened, the crisis would have been significantly amplified. The complexity of Harvey, Irma, and Maria cannot be captured in ten pages. But this outline may point to opportunities for more detailed study and analysis, especially related to the network effects of supply and demand in these three crises. When the focus of attention is narrowed to Houston, Miami, and San Juan, these were three very different events. But substantial coherence can be found in how supply and demand networks behaved. This analysis has produced three high-level – mostly unsurprising – take-aways. Where and when the grid persists, resilience tends to abide. The greater the scope of grid failure (both in terms of time and space), the greater the challenge to Supply Chain Resilience. Especially if there has been grid failure, the survival and continued operation of “super-nodes” within supply networks becomes even more important (examples of super-nodes include: water treatment and pumping facilities, fuel storage and distribution facilities, docks and other especially large network junctions such as distribution centers). Even when system capacity has survived an extreme event, the continued capability of the road network, fuel network, trucks and truckers become especially important for supply capacity to be meaningfully deployed into demand. There are also some emerging lessons-learned related to how demand is expressed (or the implications when demand cannot be effectively expressed). These outcomes are more complicated than what can be captured in one or two sentences and are given more attention below. The force that hit Houston was heavy but comparatively slow. Miami itself received a glancing blow. What hit San Juan was heavy and fast. In each case, targets included the electrical grid, telecommunications, road networks, and much more. Recognizing these force differentials can be crucial to framing an appropriate response strategy. In each of these three extreme events, the force expended by the hurricane was very significant at specific points in time and space. But only in one case did the event’s full force encompass essentially the entire network supporting a population of 3.4 million people. Miami may have been within 12-to-18 hours of not being resupplied in the aftermath of Irma. But the capability gaps opened by grid and fuel disruption were filled in time by resources comparatively close at hand. While Miami may be more a dense network appendage than a connecting node, there are robust connections to truly dense nodes at Orlando and Jacksonville and Atlanta. The island of Puerto Rico is a very different target because it is a very different network. Where Houston is deeply embedded in a network of networks, San Juan is the dense node in a fairly thin and largely separate network. Miami is 236 miles by truck from Orlando; San Juan is 1300 miles by sea from Jacksonville. Harvey and Irma seriously disrupted pieces of very large interdependent networks. On Puerto Rico, Maria disrupted, and sometimes destroyed, much of an isolated network. The distance of San Juan’s network from similar networks, combined with the density of population depending on the network, significantly increased the risk of catastrophic consequences. Less than 50 miles separate the San Juan docks from survivors in the mountains, but access was often treacherous. 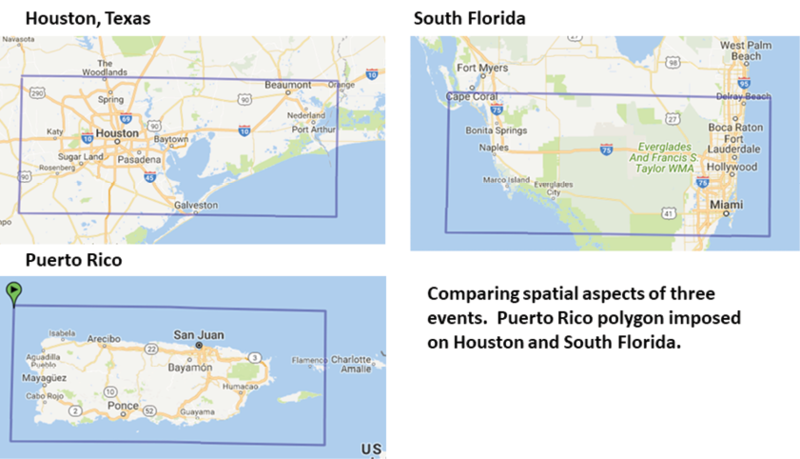 If the force of Hurricane Maria had hit similar targets in Houston or Miami or Tampa, certainly the preconditions in each of these places would have produced different results. It is also true that Maria hit San Juan with roughly 4-times the energy as Harvey-at-Landfall. The differential was even greater by the time Harvey was over Houston. Regardless of preconditions, when this kind of force hits any dense urban area with its web of interdependencies, the outcomes will be ugly. The US Department of Homeland Security identifies sixteen critical infrastructures.40 In thinking about Supply Chain Resilience, it can be helpful to differentiate between “content-agnostic” infrastructures and “content-committed” supply chains. Both can be understood as infrastructure – meaning underlying (sometimes hidden) structures on which achieving purposes depends – but some infrastructure is committed to specific purposes while other infrastructure facilitates multiple purposes. Given this framework, electrical power, telecommunications, and road systems are content-agnostic, facilitating the movement of many kinds of content. Water and fuel systems are content-committed. The food network is content-committed but ecumenical. The same functionalities that move food may also move bottled water and cleaning supplies and, sometimes, bags of charcoal, paper products, baby diapers, and much more. The pharmaceutical supply chain, in contrast, is much more parochial even when it is delivering to a grocery store. Medical goods distributors are nearly as ecumenical as food supply chains. More attention is given below to trucking (is it content-committed or content-agnostic?). The quick recovery of supply chains in Houston was allowed by sufficient robustness – resistance to change – embedded in the design and construction of the urban highway network. The effective response in Florida was enabled by significant investment in the robustness of the electrical transmission network.42 This prior investment in mitigation allowed for more timely attention to specific distribution problems, such as reconnecting power to truck-stops on I-95. In either case, would these networks have been as effective resisting four-times the force-on-target? What about eight-times force-on-target? Given the failure of the Puerto Rican electrical grid, the resilience of the Puerto Rican water system might surprise many water-system operators. But the design – perhaps more accurately, the non-design – of the Puerto Rican water system is key to this advantage. Unlike many urban systems, the Puerto Rican water network depends on many sources – 246 wells and 126 water treatment facilities – nearly half of which allow for gravity distribution and require sufficiently modest pumping operations that can be supplied by commercial off-the-shelf back-up generation. The lack of a centralized source and the diversity of system components continued to operate in the way many contemporary (and more efficient) water-systems would not. In the case of Harvey, Irma, and Maria it was possible to observe this vulnerability playing out in real time and space. In both Houston and Miami, the risk of a cascading failure often seemed imminent, yet was mostly avoided. In the case of San Juan, a cascading failure was experienced. But even in San Juan – and in Miami and Houston – the persistence and resilience of key “super-nodes” kept the human consequences from being much worse. As Irma churned up Florida’s Gulf Coast, many eyes were on the Port of Tampa and especially the Kinder-Morgan Fuel Terminal and associated Central Florida Pipeline.53 This is, essentially, a single point of failure for the fuel network serving the Tampa-Clearwater-St. Petersburg and Orlando metropolitan areas. Early weather forecasts suggested the possibility of destructive storm surge. It did not happen. The Port of Tampa, including Kinder-Morgan, experienced very little disruption. But some pointed out this was mostly just a random case of “meteorological luck.”54 It could easily have been much worse. In 2016 the risk assessment firm Core Logic estimated that storm surge comparable to that produced by Hurricane Katrina would flood over 450,000 homes and cause over $80 billion in damages in Tampa alone.55 Irma did not hit this target with its greatest force. The fuel terminals at Port Everglades north of Miami are as crucial to South Florida as Kinder-Morgan is to Central Florida. Similar risks apply to both super-nodes. Puerto Rico sources the vast majority of groceries, pharmaceuticals, medical goods, and fuel products from off the island. Eighty-four percent of all in-bound shipments move through the Port of San Juan.56 Maria moved across the island on September 20-21. The Coast Guard reopened the Port of San Juan on Saturday, September 23.57 Supplies were being unloaded that same day. Despite early worries otherwise, there has always been sufficient water, food, and fuel in Puerto Rico to meet demand. It has not always been possible to distribute and deliver supplies when and where needed, but the resources have been available. The quick recovery of the Port of San Juan allowed for sustained replenishment of supplies. This is despite loss of electricity and other severe complications resulting from Hurricane Maria. A very tough story would have been even more difficult if the Port of San Juan had been lost. In each of these examples, loss of a super-node can have an amplified effect across several networks by reducing the fundamental capacity of the system. To a greater or lesser degree, recognizing a super-node acknowledges there are network junctions where otherwise distinct content-movements are deeply interconnected. Nine weeks after Harvey hit Houston, fuel prices in Puerto Rico were roughly 16 cents per gallon higher because of the slow recovery of Gulf Coast refineries.58 Sustained loss of the Port of San Juan or the Port of Tampa or the Port of Jacksonville would have had cascading effects across any supply chain depending on fuel for distribution or delivery, which is to say all of them. In the case of the Port of San Juan, the fundamental capacity to receive almost any product – food, pharmaceuticals, fuel – would have been seriously reduced without recovery of the port. Replacement of this huge share of capacity, at least for a system as densely populated as Puerto Rico, seems very unlikely. The super-node either survives or the population does not. Harvey, Irma, and Maria each – in a different way – point to the value of pre-identifying these crucial nodes and links. Contemporary supply chains depend on receiving accurate – and reasonably coherent – expressions of demand. These are sometimes called “pull-signals” inasmuch as supply is pulled toward the sources of demand. For most major U.S. retailers and their distributors, demand is algorithmically monitored at the point-of-sale and orders reflect near real-time shifts in inventory. The prospect of extreme events – such as blizzards and hurricanes – generates historically predictable permutations in pull-signals. In advance of hurricane season, extra stocks of bottled water, batteries and other emergency supplies are pre-deployed to distribution centers in anticipation of demand spikes. But as was seen in Houston, Miami, and San Juan, at certain volumes a demand surge will always “break” the supply chain. This happens most often when distribution capabilities are not able to match an initial wave of demand. When consumers see empty shelves or other signals that suggest supply is uncertain, this often prompts a category-bursting feeding frenzy. Actual shortage of supply is a much rarer event. The increased demand for fuel in Florida was less a matter of uncertainty and hoarding than the result of millions of Floridians simultaneously driving north to escape Irma. Similarly, in Puerto Rico there was a fundamental uptick in demand for diesel fuel. As noted above, the fuel needed to energize the sudden and simultaneous use of private back-up generators was probably 500 percent of pre-hurricane demand. This sort of sustained spike in demand would overwhelm most supply chains, and certainly an isolated network serving an island. Puerto Rico’s seeming demand-shift for food was less dramatic, yet if anything, more treacherous. Need for food did not decline. But forty percent of the population could not express demand when they could not use their PAN EBT cards. These pull-signals suddenly disappeared along with dial tones and cell sites. What could the algorithms or store managers (or emergency managers) do with this silence? We know when, where, and how demand is expressed. We know how these expressions pull supply. We know how demand is influenced by uncertainty. We can know (even if we do not always know) how extreme events physically disrupt supply and demand networks. We have an increasing understanding of how these disruptions influence population perceptions. Depending on the operational context, we have several options for mitigating the perception of uncertainty and overcoming the physical challenges to effective operation of post-disaster supply and demand networks. In Harvey, Irma, and Maria, supply chain owners and operators and others interested in supply chain resilience were often surprised by population behavior. It is possible to be less surprised. In each of these extreme events, the delivery of groceries, pharmaceuticals, medical supplies, fuel, bottled water, and much more usually depended on someone driving a truck. This is often referenced as the last-mile problem. For Houston it was the problem of trucks from San Antonio (200 miles) and Dallas (240 miles) being able to deliver. In the crucial 48 hours after Irma’s passing, the 350 miles between Jacksonville and Miami was where lack of fuel almost stopped the Northern Fleet from delivering into Southern Florida. For nearly a week after Maria, many were complaining that truckers had not returned to work in Puerto Rico. But what some seemed to suggest was a character problem, has since seemed more likely a problem with fuel, demand expression, storage capacity, port-accessibility, and other impediments that could have been more effectively addressed if recognized earlier in the process. If Houston, Miami, and San Juan are good case studies, truckers are premier agents of resilience. The closer a piece in the network gets to trucks and truckers, the more resilient it needs to be to optimize their resilience. Truck stops – preexisting or post-hoc – are key to “re-fueling” both trucks and truckers. In Florida the feeding and other biological requirements of truckers were seriously complicated by over-crowding of truck-stops during the evacuation and loss of power in the aftermath. It is, however, possible to over-estimate the flexibility of truckers and trucks. This retrieves the issue raised above related to content-agnostic or content-committed infrastructures. To those outside looking in, trucks can seem content-agnostic (like the grid), the same trailer can carry groceries or many pharmaceuticals or medical goods or waste paper or a wide range of products. But most trucks and trailers and their drivers spend most of their time content-committed. It might be a different trailer, but the same truck and usually the same driver makes the same recurring run to a certain set of delivery locations. This commitment enhances creativity in case of disaster. Truckers know their local context well-enough to adapt to sudden changes. But a freezer unit is bad for fresh produce. A flatbed is non-optimal for fresh seafood. A 53-foot trailer is not well-suited for the narrow streets of Old San Juan. Not every truck has a contract or security clearance to pick-up at the port. A dry van will never deliver bulk fuel. In desperation, some in Puerto Rico were trying to convert trucks that vacuum out septic tanks to deliver diesel fuel. This unlikely attempt at re-use may demonstrate both the adaptability and the content-commitment of trucking. There is a predisposition to resilience, but trucking is much more content-committed (like a water system) than content agnostic (like the grid). The potential capacity for post-disaster response would be significantly enhanced if there were a way for trucks to become more content-agnostic. There were lots of trucks available in Puerto Rico the first week after Maria. But most of them do not call regularly at the Port of San Juan, and most are not usually involved in delivering groceries or water and certainly not relief goods. In any case, most of them could not get the fuel they needed to deliver anything. Given the essential role of trucks, truckers, and fuel to serving survivors of a catastrophic event, how well are these network-players understood? Can some of these predictable issues be engaged in advance? How can the resilience – adaptability and self-organization – of these diverse agents-of-resilience best be enhanced? Texas is not Florida, and neither of them are Puerto Rico. Harvey, Irma, and Maria were each very different beasts. Yet all three were hurricanes. All impacted dense urban areas and much less populated exurban stretches. There were several entirely comparable network effects. The Monday, August 28 front page of USA Today declared Harvey-in-Houston a catastrophe. The same designation has been used for the Florida Keys and most – if not all – of Puerto Rico. In each place the consequences continued to unfold weeks after the precipitating event. Is it meaningful to label each a catastrophe? In Houston, local language tends toward “back to business.” In the Keys, “resilience” may be a bit more common. In Puerto Rico, there are many references to “nueva normalidad” (new normal). Do these point to meaningful distinctions? If so, do the comparable network effects help explain the language differences? Which network connections, dependencies, and interdependencies held? Which ones failed? Which network elements persisted despite failures all around the and why? When things fall apart, can we show how? When darkness drops again, can we better understand how to reclaim the light? Can we help the center hold? And if the center implodes, is there a better way to pick up the pieces? Philip J. Palin is the principal investigator for Supply Chain Resilience at the not-for-profit Institute for Public Research of the CNA Corporation. He serves as staff consultant on Supply Chain Resilience with the Program on Risk, Resilience and Extreme Events of the National Academies of Sciences, Engineering, and Medicine. Mr. Palin is the subject-matter-expert supporting the FEMA-National Integration Center Technical Assistance Program on Supply Chain Resilience. 1 For the purposes of this discussion, the supply chain is the socio-technical network by which demand is identified, targeted, and fulfilled. It is the process of deciding what, when, how, and how much is to be moved where. Supply Chain Resilience is the theory and practice of enhancing the ability of the supply chain to recover from or adapt to major disruptions. 2 Philip J. Palin, The Role of Groceries in Response to Catastrophes, CNA Institute for Public Research, 2017. 3 Distance and access are closely related. Short-distances that are made inaccessible can produce network and human consequences similar to the complications and delays innate to great distances. 4 ABC13 News, 96 percent of Centerpoint Customers have Power, August 29, 2017. 5 Federal Communications Commission, FCC Status Report, August 31, 2017. 6 CBS News, Harvey Floods Left Houston Water Plant Hours Away from Failure, September 5, 2017. 7 Platts, Oil Prices Soar on Harvey-Related Outages, August 31, 2017. 8 J.P. Lawrence, “Hoarders Blamed for Aggravating Run on Fuel,” San Antonio Express-News, September 3, 2017. 9 Truckers widely reported the absence of all but the most essential security perimeters in the aftermath of Harvey. More extensive perimeters were considered, but there were higher priority claims on public safety personnel. 10 Amy O’Connor, “Florida’s Hurricane Irma Recovery: The Cost, The Challenges, The Lessons,” The Insurance Journal, November 30, 2017. 11 Energy Information Administration, Irma Cut Power to Nearly Two-Thirds of Florida’s Electricity Customers, September 20, 2017. 12 Federal Communications Commission, FCC Status Report, September 12, 2017. 13 Alex Harris, Florida Keys Live Blog, Miami Herald, several posts September 11 to 19, 2017. 14 Fatalities related to Hurricane Maria’s impact on Puerto Rico range from a low below 100 to more than 1200. In February, 2018 the Government of Puerto commissioned an independent study of fatalities by George Washington University, see: “Puerto Rico Deaths Related to Hurricane Maria Continued for Months,” LA Times, February 28, 2018. 15 Laura Quentero, “Repairing Damaged Towers Connecting Metro Area,” El Vocero, October 23, 2017. 16 These preliminary impressions were submitted to Homeland Security Affairs on December 14, 2017. Following peer review and edits, the final draft was completed on March 4, 2018. On Thursday, March 1 most of metropolitan San Juan experienced another in a series of extended black outs and several communities in the mountainous interior have remained off the grid since September 20. 17 Federal Communications Commission, FCC Status Report for Areas Impacted by Hurricane Maria, October 12, 2017. 18 El Nuevo Dia, “Falta de Electricidad Pone en Peligro Servicios de Telefonia et Internet,” October 18, 2017. 19 At least three long-term transportation impediments continue to complicate traffic in the San Juan Region: the intersection of PR 165 and PR2, PR-177 at Ave. Lomas Verdes, and PR-176 at Ave. Victor M. Labiosa. 20 Laura Quintero, “Aumentan Derrumbes de Tierra Colapsos de Puentes,” El Vocaro, October 19, 2017. 21 Wanda L. Molina-Rivera, US Geological Survey, Estimated Water Use in Puerto Rico, 2014. 22 Marian Diaz, “Demand Triples After the Passage of Maria,” El Nuevo Dia, October 23, 2017. 23 John D. Sutter, About One Million Americans without Running Water, CNN, October 18, 2017. 24 The U.S. average is over 8800 persons per supermarket. Between 2000 and 2016, the population of Puerto Rico fell by about 400,000 or 10 percent. News reports suggest at least 200,000 Puerto Ricans have relocated since September 20, 2017. Consolidation of the grocery retail sector is likely in 2018. 25 Will Robinson, “Puerto Rico Devastated by Maria, Looks to Jacksonville Businesses for Help,” Jacksonville Business Journal, September 21, 2013. 26 Paola Arroyo Guzman, “Government to Buy Stranded Containers in Ports,” El Vocero, September 29, 2017. 27 To underline an important distinction: the fuel capacity available on the island was greater than the distribution capacity. There was never a shortage of fuel available to be distributed. But the distribution capacity – and the delivery capability – of the fuel system was not sufficient to meet a sudden and substantial increase in demand. In contrast there was a preexisting and surviving capacity to distribute and deliver non-fuel products. The capability to express this non-fuel capacity was constrained by the impediments noted above. 28 Marian Diaz, “Puerto Rico Fuel Market Transformed,” El Nuevo Dia, October 25, 2017. 29 Some sources claim that wholesalers were initially excluded from curfew operations and the eventual inclusion and claim of “confusion” was an ex post facto assertion by the government. 30 Sharon Minelli Perez, “DACO Prohibits Businesses Limiting the Sale of Gasoline,” Primera Hora, September 28, 2017. 31 Container Management, San Juan Back to 84 Percent Capacity Following Hurricane Maria, October 16, 2017. 32 Caribbean Business, Price Freeze on Basic Necessities Extended in Puerto Rico, September 13, 2017. 33 Federal Emergency Management Agency, Hurricane Maria Update, October 19, 2017. 34 Gloria Ruiz Kuilan, “Thousands of PAN Beneficiaries Cannot Use Their Card,” Primera Hora, October 24, 2017. 35 Palin interviews with FEMA officials. 36 For more on this interplay between human design and complex adaptive emergence, see Geoffrey West, Scale: The Universal Laws of Growth, Innovation, Sustainability, and The Pace Of Life In Organisms, Cities, Economies, And Companies, (New York: Random House, 2018). 37 According to the British Dictionary, a joule is the International System of Units measure of work or energy; as when at the point of application, the force of 1 newton is displaced through a distance of 1 metre in the direction of the force. 1 joule is equivalent to 1 watt-second, 10 7 ergs, 0.2390 calories, or 0.738 foot-pound. A terajoule is one trillion joules. 38 RMS, Insured losses from Hurricane Maria, September 28, 2017. 39 Annie Lowrey, “Americans are Sending Too Much Stuff to Houston”, The Atlantic,October 25, 2017. 40 Department of Homeland Security (PPD-21), Critical Infrastructure Sectors, July 2017. 41 Marcia Heroux Pounds and David Fleshler, “85 Percent of Central Florida Cell Towers Now Restored,” Orlando Sentinel, September 13, 2017. 43 Jeremy I. Fisher and Ariel I. Horowitz, Expert Report, Synapse Energy, November 2016. 44 Government of the Commonwealth of Puerto Rico, StatusPR, October 29, 2017. 45 The distinction between robustness and resilience is helpfully summarized by Mens et al. (“Developing System Robustness Analysis for Drought Risk Management: An Application on a Water Supply Reservoir,” Natural Hazards and Earth System Sciences, January, 2015): “The concept of robustness originates from the engineering literature, where it is defined as the ability of systems to maintain desired system characteristics when subjected to disturbances” (Carlson and Doyle, 2002). A similar concept, resilience, originates from the socioecological resilience community and is defined as the ability of ecosystems or socio-ecological systems to absorb disturbances without shifting into a different regime (Holling, 1973; Walker and Salt, 2006; Folke, 2006; Scheffer et al., 2001). Robustness and socio-ecological resilience are comparable concepts (Anderies et al., 2004), but robustness is considered more suitable for systems in which some components are designed (Carpenter et al., 2001). While supply chains are more-or-less designed, I would argue they are – increasingly—much more emergent socio-technical systems than engineered systems. Therefore resilience is a more promising framework for enhancing the survivability of content-committed infrastructures. 46 Li, et al., “Identifying Vulnerable Nodes of Complex Networks in Cascading Failures Induced by Node-Based Attacks,” Mathematical Problems in Engineering, 2013 , Article ID 938398. 47 Matt Egan, “Texas Oil Refineries Still Hurting from Harvey,” CNN Money, September 11, 2017. 48 Energy Information Administration, Hurricane Harvey Caused U.S. Gulf Coast Refinery Runs to Drop, Gasoline Prices to Rise, September 11, 2017. 49 American Society of Civil Engineers, Report Card for Houston Area Infrastructure, 2012. 50 CBS News, Harvey Floods Left Houston Water Plant Hours Away from Failure, September 5, 2017. 51 Alex Samuels and Cassandra Pollock, “Beaumont Loses Water Supply,” Texas Tribune, August 31, 2017. 52 Beaumont Enterprise, “Beaumont Has Running Water Again—to a Degree,” September 1, 2017. 53 Kinder-Morgan, Tampa Fuel Terminal, 2015. 54 Henry Fountain and Brad Plumer, “The Monster Surge that Wasn’t,” New York Times, September 11, 2017. 55 Core Logic, CoreLogic Storm Surge Analysis, June 2016. 56 US Army Corps of Engineers, Waterborne Commerce of the United States (WCUS) Part 2 – Gulf Coast, Mississippi River System, and Antilles, 2010. 57 US Coast Guard, Port Condition Updates, September 23, 2017. 58 Marian Diaz, No Truce in the Demand for Fuel, El Nuevo Dia, October 30, 2017. 59 Ted G. Lewis, Center for Homeland Defense and Security, Risk Methods and Models, 2014. 60 Michael Lynch, “Best Oil Lesson of Harvey: People Hoard,” Forbes, September 7, 2017. 61 From indirect evidence, I think it is very likely that fuel supplies in areas dependent on the Colonial Pipeline were significantly reduced during most of early September. But considerable effort was made by the US Department of Energy, Colonial Pipeline, and its clients to avoid exciting consumer uncertainty. As a result, retail networks were mostly kept minimally supplied, hoarding was avoided, and a real supply crunch was thereby avoided. 62 CNN Weather, A Day by Day Look at Hurricane Irma, September 8, 2017. 63 Post-Irma, many Miami retail locations did not open. In the case of several retail chains, up to two-thirds of storefronts remained closed for two to three days as electricity was restored. But those locations that were operating – often on generator power — were fully stocked and effectively re-supplied. By design or accident this “re-sizing” of the retail network allowed distribution/delivery assets to meet demand, avoid sending signals of uncertainty, and prevent hoarding behavior. 64 Michael Watkins and Max Bazerman, “Predictable Surprises: The Disasters You Should Have Seen Coming,” Harvard Business Review, 2003. 65 Philip J. Palin, “Supply Chain Resilience: Diversity+Self-organization =Adaptation,” Homeland Security Affairs 9, No. 14, (August 2013). 66 Given the creativity, adaptability, and self-organization required in extreme events, I worry about the – now apparently inevitable – development of autonomous vehicles as the core of mid-century trucking fleets. This sounds like another optimization setting-up catastrophic cascades. Excellent review and analysis of the ‘fog of war’ (or in this case ‘disaster’). The concepts presented provide an easy to understand 30,000-foot overview of conditions impacting and experienced by the networks discussed, that can be readily applied to other locations / networks pre-disaster, in preparation and response.